I started birding in 2005. During 2005, I could not bird much as it required traveling to different habitats. 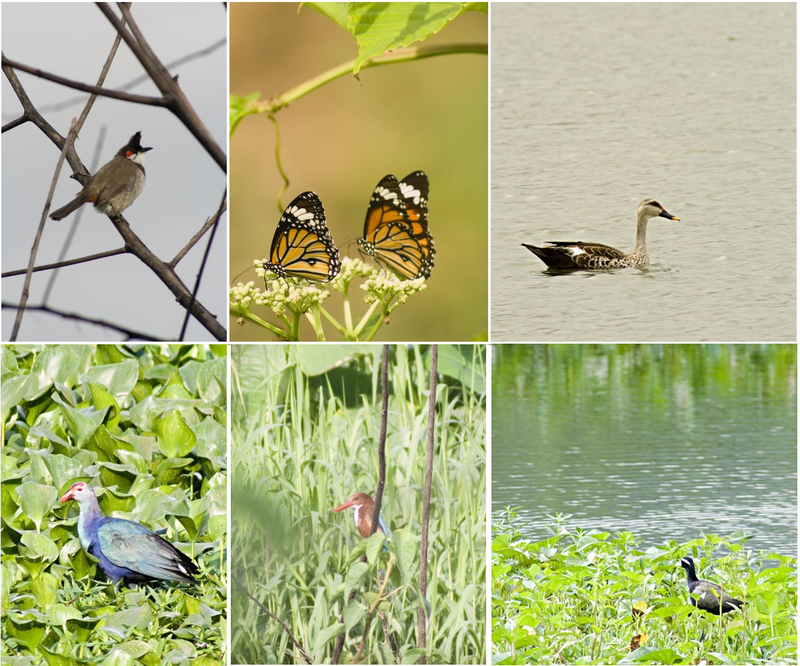 However,after joining Vegayan Systems I could do birding as my office is located in IITB campus, which is very leafy in nature with a lake. There are very less vehicles around and probably this may be one of the reasons for good bird population in here. I have seen many beautiful garden birds like Oriental Magpie Robins,Coppersmith Barbets and Purple-rumped Sunbirds, Rose-ringed & Alexandrine Parakeets, Redvented & Redwhiskered Bulbuls, Common Tailorbirds, Common Iora, Ashy Prinia, Greater Coucal, Common Myna, Asian Pied Starlings, Roc Pigeons etc along with ubiquitous Asian Koel and House Sparrows enroute to office in the morning. I can see Palm Swifts fly around the Bottle Palm trees that dot the campus and few Dusky Crag Martins from our conference room. From my seat, I can watch, kites, rock pigeons and common mynas. This is a wonderful opportunity for a person like me as I am in the initial learning stage of birding. My team members are very co-operative in my birding activities, Sometimes they join my bird walk, sometimes they lend their cameras, they helped in buying a binocular, they take pleasure in showing birds to me and even allowed me to set server hostnames with some of my favorite birds … it has been a great experience overall. Evening I take my coffee from staff canteen. This canteen is surrounded with lot of green. This place is bit away from the office but I prefer to go there as on my way I get to see a flock of Jungle Babblers,Yellow-eyed Babbler,White-browed Bulbuls, tailor birds while, Spotted Dove in the shrubs, Coucals and Zitting Cisticola. I have seen over 55 species during the course of a my rewarding stay here. You can see pictures of some of the birds at our campus here. For a birder it is very important to watch birds of different habitats and so that was the reason I joined “Mumbai Bird Watcher’s” club. I also have a added advantage of learing about birds from experts. This birder’s club is great. We go for birding every weekend. I invited the bird club members to our campus for birding too. We have had 2 bird walks in our office campus so far. You can read the IIT bird walk report and pictures here [ 1 / 2 ]. In the recent past I am spending more time on exploring and understanding the bird nests. On the other day I saw common iora’s nest in the garden here, it was a wonderful craft with camouflaged in the greenery !! !.For the first time I also saw a black drongo sitting in its nest in the branches of a high Rain Tree. Just outside of our office building, there is a black kite’s nest …. it is a wonderful experience of watching a young ones in the nest. Last winter some of us watched the coppersmith barbet building it’s nest just outside our building near the tea shop. I changed my tea time to suit the nest-building time of this bird. It usually appeared around 11:00AM. There use to be a couple of them, they took turns in building/pecking their nest on a dry stem of the tree.